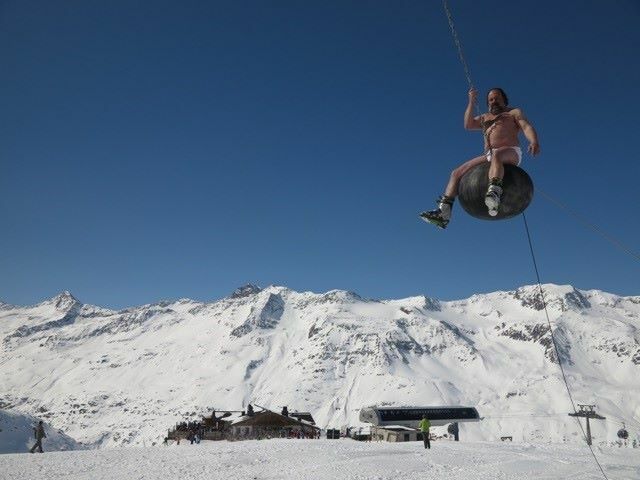 There’s no doubt that this effort from Val Thorens was the best snowsports April Fool this year. Teleportation for skiers is not only a brilliant idea (and top of my wish list of superpowers), but it was executed superbly. Their video is professional, well-scripted and subtitled in English. It was scheduled to go out on different social media early on the morning of 01 April, so it caught attention early on in the day. 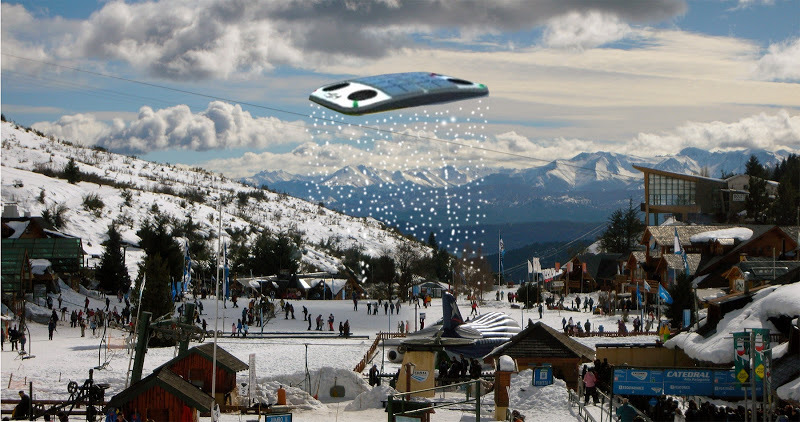 We really liked Ski Vermont’s ‘cow manure cloud seeding’ idea. Again their video was well-produced, but it’s great to see a resort that doesn’t take itself too seriously. Yes, the snow in the Eastern States has been poor this year, but rather than try and avoid the issue, Ski Vermont decided to have some fun (and kept on message with a reminder that 80% of their pistes are covered by artificial snow). Bringing politics into the mix were TGR with this cracking tale of how US presidential candidate Donald Trump plans to build a new ski resort ‘on sensitive wildlife habitat with no regard to environmental regulations’. 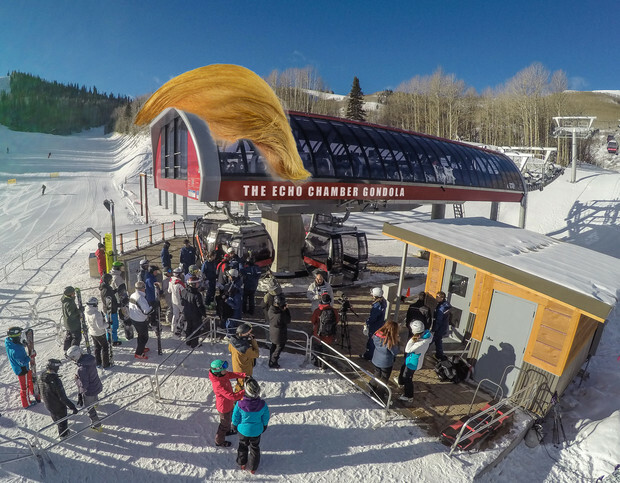 Apparently Trump International #1 Ski Resort ‘will make Vail Resorts look a penny slot casino in Reno.’ A new lift – the Echo Chamber (shown below, complete with wig) will be ‘a single-person gondola that will encourage insular political rhetoric’. 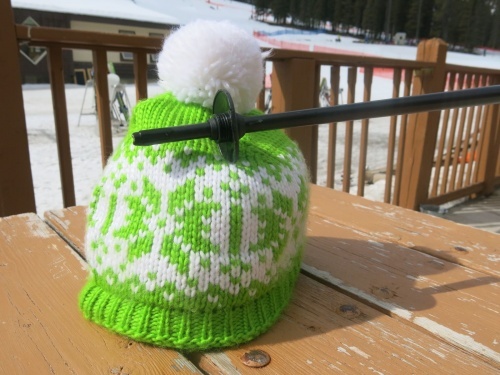 James Cove from Planetski.eu also made an effort with this piece about a beanie that doubles as a helmet. It appeared so well researched and structured that we are willing to bet it would have fooled more than a few casual web surfers. While the idea has been pinched directly from Evian’s deadly serious marketing in the 90s, Ski Amade deserve plaudits for the quality of this ‘new superfood’ production, that has now registered almost 110,000 views on Facebook. 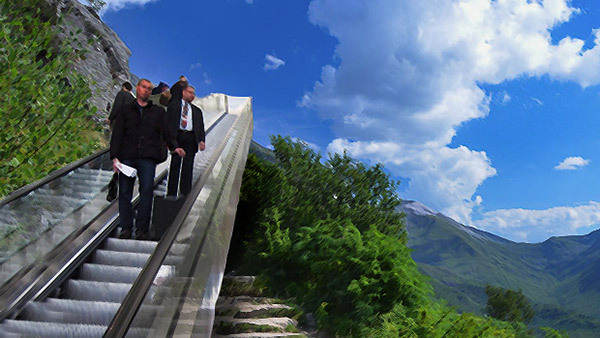 Ellis Brigham joined in with this amusing item on a possible escalator to the top of Ben Nevis. Perfect outdoorsy material for their audience, a good image and topical after the recent spate of unprepared recreational walkers. Who wouldn’t click on this? Catsledding is so magnificent, it’s a surprise it’s never been done before – or does it really exist? This great idea has some even better pictures of cats in snow. Chapeau to the Everinet group (Merinet, Chamonet, Valdinet etc). Ho, ho! Skiing where you don’t normally ski. And the joke’s on you if you try to book. Or maybe the joke’s on us, as here’s another inbound link to their website. So never mind the width, feel the SEO quality. At first we weren’t 100% sure if this was a joke or not. After all, it sounds like a useful service and there are plenty of unemployed Europeans who are looking for work. Maybe the Swiss do offer the chance to become a ‘federally certified mountain cleaner’. However, it turns out that this is a recycled April Fool from 2009 (which kind of makes sense). We really, really want this to be a genuine new feature in Obergurgl, but unfortunately it does appear to be an April Fool. It works with a similar level of subtlety to their ‘viral’ video from last autumn – the originally titled ‘Funny ski resort webcam footage’. The picture’s good. Sort of. But it’s not really funny. Although it is obvious at least: no-one will mistake this for a real story. It’s just a shame that there’s not more humour and instead their blog post is packed with links – it all feels just a bit too commercial and nowhere near the depth that’s gone into some of the other Fools. 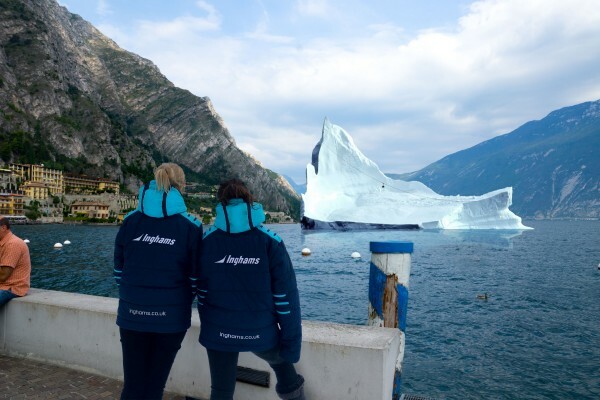 We like the fact that this idea from Crystal Holidays isn’t too salesy – in fact the company only gets mentioned in passing at the end – it’s also amusing, with a great image and a ‘science bit’ that would probably convince a few people. 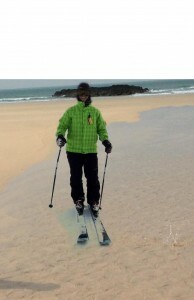 Less convincing, but still amusing was Heaven Publicity’s revelation that their founder Lynsey Devon had been recruited as a possible ski jumping prospect for the British team.